The Journal of Nervous and Mental Disease, America’s oldest continuously published independent monthly journal in the field, will celebrate its 200th volume in 2012. 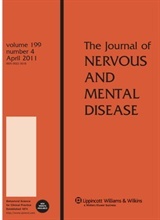 Editor-in-Chief John A. Talbott, M.D., has announced that the anniversary issue will be dedicated to the history of psychiatry and neurology and has asked that submissions of papers of a historical nature (especially subjects from 1974 to the present) be sent to him online at <www.editorialmanager.com/jnmd>. The deadline for these review articles, which should be between 4,400 and 8,800 words, is December 1.